​Away from the commercialism of the large ski resorts yet fully linked to the Three Valleys’​ lift system by a speedy eight-seater gondola and brand new covered 6-seater chairlift. ​This way you are able​ to reach the heart of the Three Valleys in no time! “Les Trois Vallees” is situated in the heart of the French Alps. 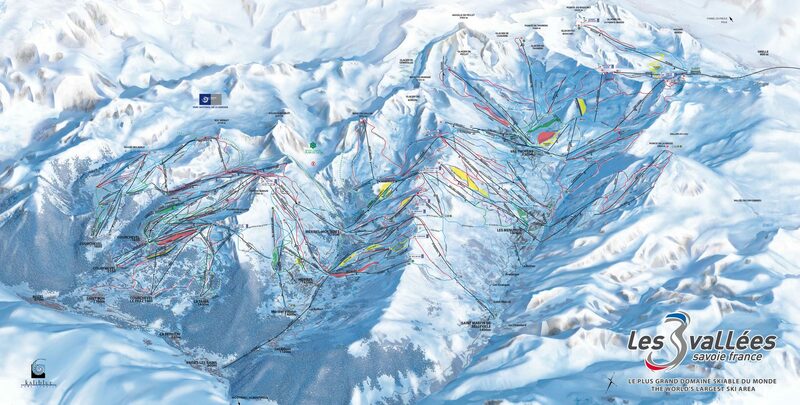 This ski area has rightly earned its name as the largest integrated skiing area in the world. 335 marked ski-slopes offer a total of 600 kilometres of pure skiing enjoyment. Thanks to around 180 ski-lift installations, the ski-slopes at between 1300 and 3200 metres are reached quickly and easily. 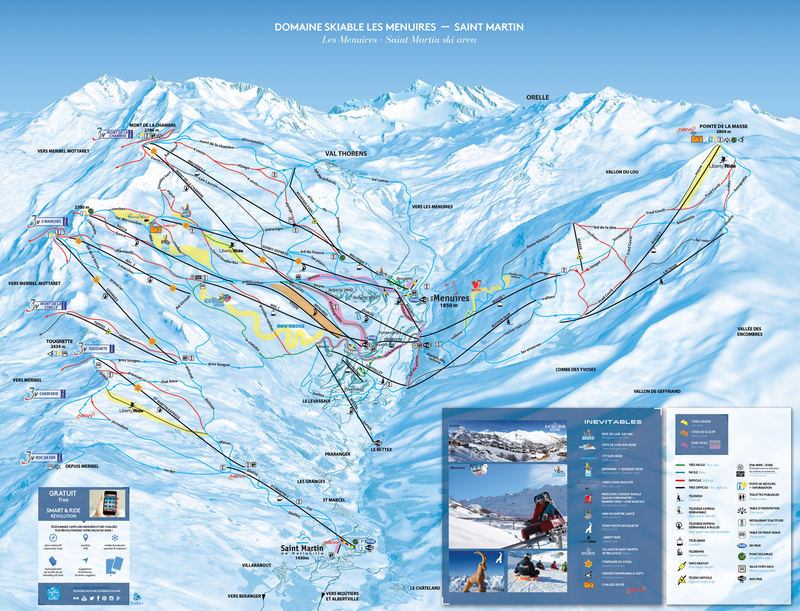 The reason: The generous infrastructure of ski-runs and ski-lift installations connects not only the large ski stations at Val Thorens, Les Menuires, Meribel-Mottaret and Courchevel with one another but also the up-and-coming smaller and more traditional skiing locations at Saint Martin, La Tania and Brides les Bains. The Belleville valley is fully connected into Les Trois valley ski area which means that skiers that stay in one of the smaller resorts can experience all three valleys of the skiing area in a single day without hassle! From easy to difficult runs, there’s something for everyone, so that experienced skiers as well as beginners can all enjoy a tour through the valleys. St Martin de Belleville has many excellent restaurants, a few bars, a couple of supermarkets, several ski hire shops, a bakery/patisserie, a butcher and various gift shops. 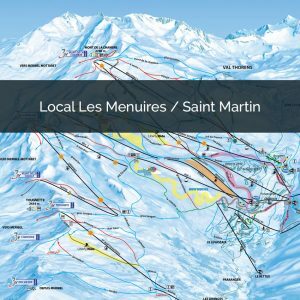 There are two lifts in St Martin de Belleville – The main ‘St Martin 1’ cable car in the upper part of the village and a drag-lift in the centre which takes you up to the cable car. The upper part of the village is where you will find the St Martin 1 gondola, a couple of (mostly day-time) restaurants & bars, the ski school meeting points, several ski rental shops, the ski pass office as well as a small supermarket. As well as the main gondola, there is a new beginners area and two magic carpets – perfect for learning! ‘Chalet Fruitière’ (Apartment Astragle, Camarine & Bernardie) and ‘Chalet Saint Pères’ are located here. The lower part of the village, situated around the beautiful Baroque church, is where you’ll find most of the restaurants, shops and bars, the tourist office & museum as well as the ‘Huit à 8’ supermarket (larger than the Proxy Market in the upper part). For skiers this area is connected to the higher part of the village via a (one-person) drag lift. It is less than a 10-minute walk. There are several free parking areas in the village where you can leave your car all week. The largest one is ‘Le Cochet’ in the upper part of the village. Driving from the village centre towards the Cochet car park you will see several parking spots on the left-hand side of the road. (Directly after the post office.) These are also free parking spaces. In the village centre there is free parking on the road going up left past the L’Eterlou Restaurant. There will find further parking on the next left (road called “Rue Basse de la Duche”). Alternatively there is a free parking lot closer to the entrance of the village on “Route du Chatelard”. All parking areas are marked on the resort map.